A project is in the works to use a remotely-piloted, camera-equipped drone to search for evidence of Sasquatch in the western United States. More information at The Falcon Project. I urge anyone who is able to make a modest donation to support the effort. 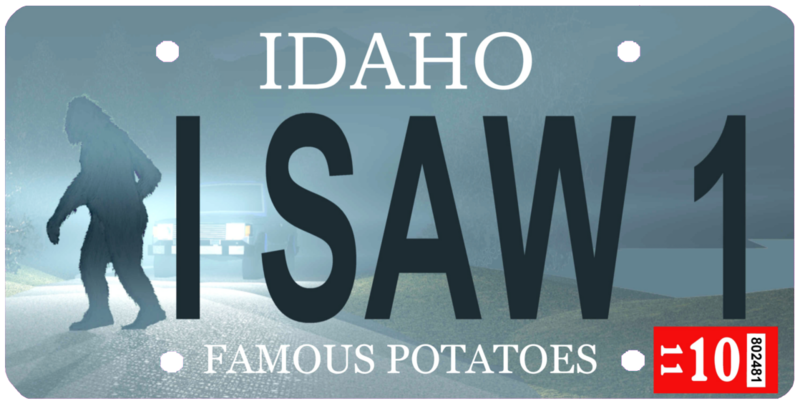 Though I think there is a very good chance that Sasquatch (Bigfoot) exists it is obvious that I do have fun with the idea. Let the bad guys know you take safety and security seriously. Unobtrusive safety – as Sasquatch are so rarely seen you will hardly know they are there. Franchises are available in other states. 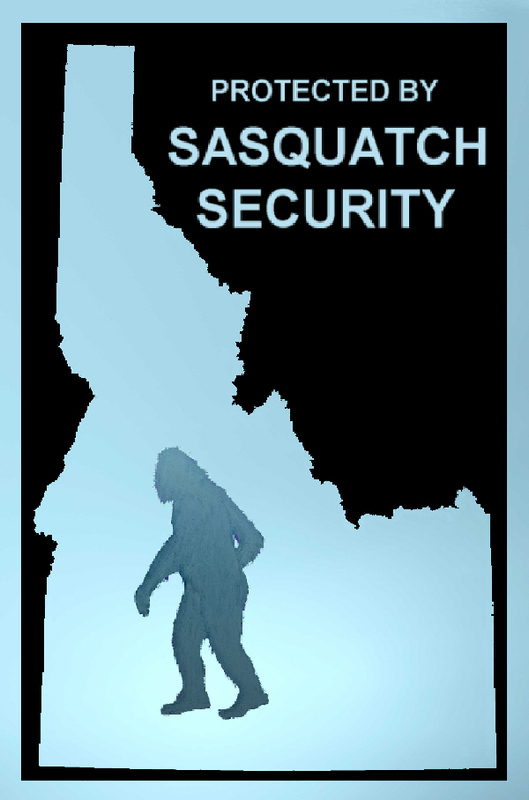 Let me know if you wish to open a branch of Sasquatch Security franchise in your state I will adapt the logo. If you live or travel in rural areas of the Pacific Northwest you may possibly come across one of the region’s lesser-known species of native wildlife. “Sasquatch” is an anglicized derivative of the word “Sésquac” which means “wild man” in a Salish Native American language. Sasquatch is reported to be a large, hairy ape-like creature, ranging between 6–10 feet tall, weighing in excess of 500 pounds, and covered in dark brown or dark reddish hair. Alleged witnesses describe large eyes, a pronounced brow ridge, and a large, low-set forehead; the top of the head has been described as rounded and crested, similar to the sagittal crest of the male gorilla. Sasquatch is commonly reported to have a strong, unpleasant smell. Enormous footprints for which it is named are as large as 24 inches long and 8 inches wide. Tufts of hair of an unidentified primate species are often found. Most scientists say Sasquatch, aka Bigfoot, is nothing but folkloret and attribute sightings or footprints to misidentification or hoaxes. However, some scientists such as Jane Goodall believe it may exist. Based on examination of footprint casts, Professor Jeffrey Meldrum of Idaho State University, an expert on foot morphology and locomotion in primates, believes sufficient evidence exists to warrant to warrant further investigation. One theory suggests Sasquatch are a relic population of ancient hominids which reached North America from Eurasia via the Bering Land Bridge during a period of glaciation. Stories about Sasquatch-like creatures are found among the indigenous population of the Pacific Northwest. The legends existed prior to a single name for the creature. They differed in their details both regionally and between families in the same community. Similar stories are found on every continent except Antarctica to include the Yeti of the Himalayas and the Australian Yowie. Members of the Lummi tell tales about Ts’emekwes, the local version of Bigfoot. The stories are similar to each other in terms of the general descriptions of Ts’emekwes, but details about the creature’s diet and activities differed between the stories of different families. Less menacing versions such as the one recorded by Reverend Elkanah Walker exist. In 1840, Walker, a Protestant missionary, recorded stories of giants among the Native Americans living in Spokane, Washington. The Indians claimed that these giants lived on and around the peaks of nearby mountains and stole salmon from the fishermen’s nets. The local legends were combined together by J. W. Burns in a series of Canadian newspaper articles in the 1920s. Each language had its own name for the local version. Many names meant something along the lines of “wild man” or “hairy man” although other names described common actions it was said to perform (e.g. eating clams). 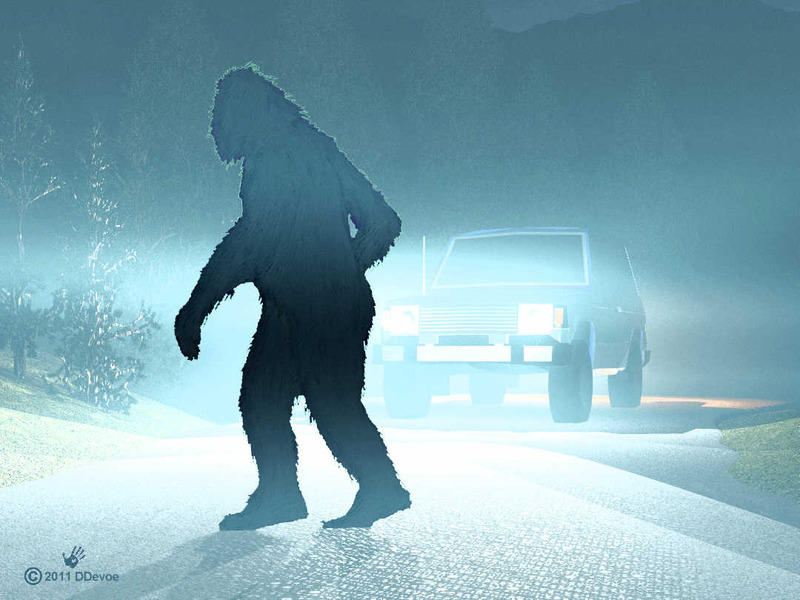 Burns coined the term Sasquatch, which is from the Halkomelem sásq’ets (IPA: [ˈsæsqʼəts]), and used it in his articles to describe a hypothetical single type of creature reflected in these various stories. Burns’s articles popularized both the legend and its new name, making it well known in western Canada before it gained popularity in the United States.